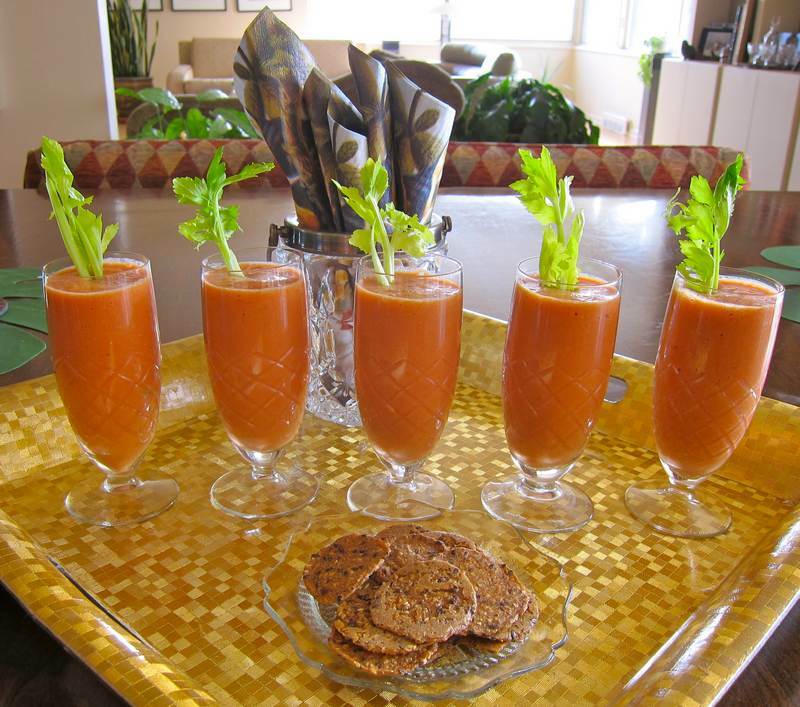 Eureka – Lentil Shooter – The perfect start to a healthy meal! Shri Yoga did it again. Thank you, Mona Keddy! I prayed a tiny prayer on my way in. You know how they say that if you pre-plan to solve a problem as you sleep, then your mind will work it out. Well, it works for yoga, too. Ask for inspiration as you begin, and if you are desperate enough, it may come. Here is my 4th and final entry for the Canadian Lentil Contest in the appetizer category. It came to me at the tail end of Shavasana, my absolute favorite of all the yoga poses. As per the contest instructions I have kept the recipe simple enough for everyone to reproduce. This recipe has 2 ingredients. Well it has 3 if you count water, and 4, if you count the garnish. 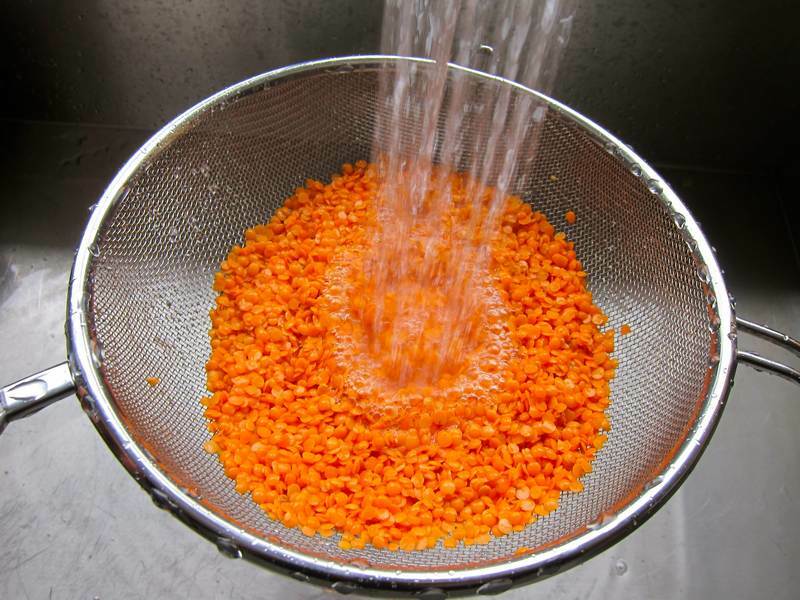 Rinse lentils. Bring the lentils and the water to a boil, then simmer for about 8 minutes until the lentils are soft (red lentils get soft quickly). 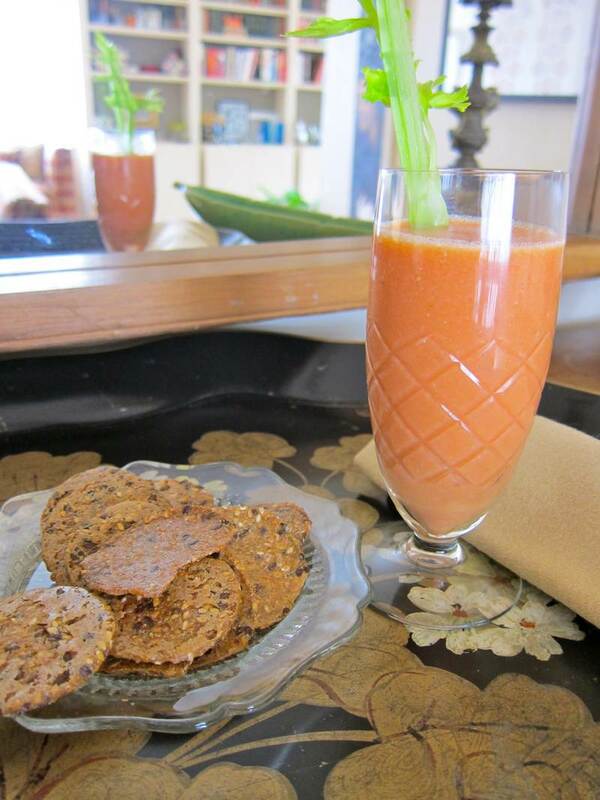 Use a blender to combine the cooked lentils with the vegetable juice, or use a Magic Bullet to blend 1/4 cup cooked, still hot lentils with 1/2 cup vegetable juice for single 3/4 cup shooter sized portions. The texture is frothy, and the taste is perfect. The vegetable cocktail has such a great tangy flavour that you don’t need any additional seasoning. Serve warm for best taste. It isn’t easy to come up with such a great tasting appetizer that combines healthy, no-fat, satisfying, no fuss and attractive all in one. Tick, tock. 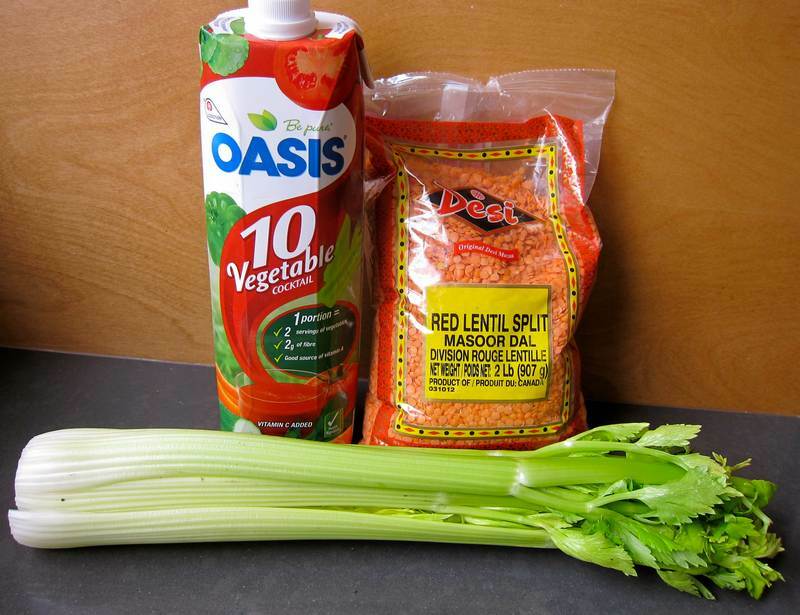 Time is running out on the Canadian Lentil recipe challenge. Please comment on this post below and/or on the Jittery Cook link on the Canadian Lentil Facebook Page. Popularity counts, and that’s where YOU, dear readers can help. If I am fortunate enough to win the grand prize, then I’ll invest in a Vitamix blender. I’ve no idea what they cost, but I know that they work magic in transforming foods. « Tomato Basil Pine Nut Pasta- Happy St. Paddy’s Day! Thanks! I love getting your support Dorothy! Holly’s a wiz at transforming lentils! Wow! Another one that sounds amazing — easy enough even for me! Any recipe I can memorize, is right up my alley! Way to go, Holly…I hope you get that blender! I really enjoyed an Oasis vegetable juice I had last week. Then my yoga teaches started talking about the power of putting things together and the sum being more than just the parts. Hats off to simplicity, how about a chia shooter? If I win the contest and get a Vita Mix, I promise to make a delicious chia shooter! Wow I can’t believe how yummy this looks! These lentil shooters look delicious. Can’t wait to try your recipe! mmm good. WOW! Two great entries in one day. You’re definitely my winner for the lentil contest!! Beautiful and healthy! Worthy of trying. Oh! How interesting this looks! Please win the contest. Win or lose….get a Vitamix! Jim got one from Costco for ~500$ – I thought he was crazy to spend that money but our entire household has consumed more fruits and vegetables in the past 3 months than in the last 3 years! We have an entire shelf of smoothie additions (hemp seds, chia seeds, goji berries, cacao nibs the list goes on!) And you can cook a great spinach soup right in it! (Which heats it enough to taste good but I believe the temp stays low enough to still be considered “raw” – if that is something that interest you….Wow, I think I need a commission from the vita mix people! I’ve already asked them to advertise on my blog. No response yet. I never would have figured you to be my first friend with a Vitamix! Surprise, surprise! I will definitely get one either way. My brother made me an offer that would be hard to refuse involving posting recipes for his Earth Circle Organics web site.